At nunchi we have a strong belief in serendipity, chance events that bring happiness and good fortune. Meeting Devyn has been one of these serendipitous moments. We first crossed paths at the Emu Plains Market, Balnarring, on the Mornington Peninsula in Victoria. She told us she had purchased some nunchi from her friends store, Darling Style Merchants, Cheltenham, and had fallen in love with her chosen spray, no mud, no lotus. On our second meeting at the Showroom Surf & Espresso cafe in the NSW coastal town of Scotts Head, we realised Devyn was ‘living her dream’, a cliché we know but when someone so young takes the brave choice to give up the security of home, jump in a van on their own and see where they end up, that takes courage. Devyn was embracing all that we admire. She has chosen to follow her heart, immerse herself in nature, take chances, meet new people and contribute to the community by facilitating and writing programs to inspire young girls. Inspiring people comes so naturally to Devyn. 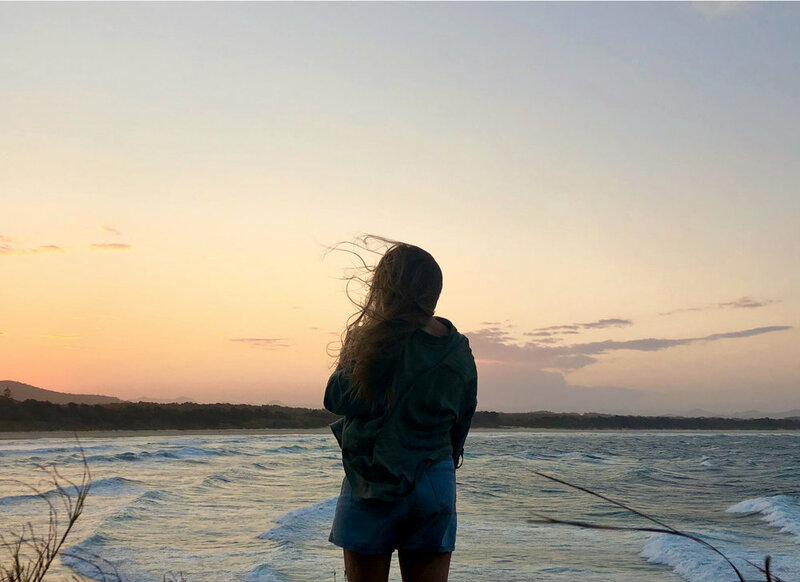 Read about why she chose to leave, her love of the ocean and the outdoors and how her adventure has evolved so far. We cant wait to cross paths with you again Devyn. What inspired you to begin your van journey? I think there are times when the world can swallow you whole and suddenly you lose yourself in the hustle of trying to live a life that society deems as ‘successful’. It took a while for me to realise that a life of success meant years of stress, grey skies and inauthenticity. I had always known that there was a myriad of ways to trek through life but it’s an obvious truth that the easiest path is the one already laid out for you. My resistance to do as expected and choose the obvious finally sparked the courage to seek my own path. Choosing to live my life on the road was a choice of simplicity and connection. I had a yearning to strip my world of all its complexities and immerse myself in the bare essential pleasures. I wanted to relish in nature, drink my morning cuppa slowly and align my body clock with the sun. I wanted the freedom to learn and understand my own inner workings. I wanted to slow the pace of living so that it allowed for more potent and beautiful connections with people. I wanted enormous chunks of solo time and even larger portions of time in the sea. And most importantly, I wanted to have the space and capacity to explore my authenticity and create my version of a successful life. So I packed all my surf boards and my favourite books to chase warmer weather and more purposeful work. It's been heavenly so far. What are the 5 most important things in your self care checklist? 1. Salt water therapy. It's a little cliché but I am an avid believer in the salty power of the ocean, a good ol' teary and a decent sweat session. These fundamentals of my self care are not only my most reliable remedies for an aching heart or a heavy day, they are my every day essentials for a vibrant life. There is not a day in my life that I don't exercise, spend time in sea or have a cheeky cry (happy tears included). 2. A warm cup of joe and a whole hearted chat. There is no greater soul soother than hugging a mug of warm, milky goodness and connecting with someone that I absolutely respect and appreciate. I live by the famous words of Brene Brown that "connection is why we are here: it is what gives purpose and meaning to our lives". When it comes to fueling my spirit, nothing tops an honest conversation with a person I adore over a cuppa...or a big glass of red wine. 3. Sleep. I know, a very predictable and obvious answer but after listening to a podcast with Dr. Matthew Walker, the importance of sleep bolted its way into my top priorities for self care. For the frightening science behind the powerful impact of sleep on our health and wellbeing, Google this great man . Science aside though, I know that I am better functioning, more present and joyful human when I get consistent and decent sleep. Fact. 4. An everyday dose of nature. I have no doubt that the greatest elixir in life is time spent in the natural world. I believe we are hardwired for a deep and unwavering connection with mama earth. I always notice an instantaneous shift in my wellbeing on the days I forget to fill my lungs with fresh air. Hence, you'll find me somewhere in the nature every damn day. 5. Stoop time. A beautiful friend of mine explained the notion of 'stoop time' that derived from the early 1900s when folks would sit out on their porches or entrances to their apartments for no other reason than to sit, ponder and chat with those walking on by. Today, my translation of this is about giving myself an undefined amount of time to slow my world right down so that I can get lost in a decent book, freely and creatively write, sift through my endless thoughts, daydream a little or simply rest. I think it's the age old 'check out to check in' which pauses the chaos and serves as my grounding reminder to live more gently. Tell us about the work you do with youth groups? Having been a facilitator and youth worker for 10 years, I am lucky to say that my job description is forever changing. However, the constant in my line of work is the passion for meaningful workshops for young people to explore the nitty gritty issues in their life so they can develop the self awareness and self worth necessary for chasing their dreams. At the moment, I am based on the mid north coast NSW doing the program design and delivery for a new start up business called Igniting Minds that works with young people, youth professionals and communities to inspire young people to make positive change in their lives. Through Igniting Minds, I am in the process of creating and implementing a program for young women to wrestle and redefine the expectations that society places on them so that they are empowered to make their own, educated decisions in their life. It is my hope that young women develop the inner strength to steer clear of the constant comparison and criticism at their finger tips everyday and focus their energy on their passions, unique strengths and dreams in life. Ah, this question. Where to begin? I am one of those people that will have a different answer every time you ask me. My vision for my life is an ever-evolving project that I think about every day. For now, I hope to continue to create out of the ordinary spaces and conversations for people so they feel more capable, worthy and inspired to reach their full potential. I hope to travel to every inch of the world in pursuit of creativity, connection and perspective...and of course, great waves too. I hope to write a book, become a celebrant, build a tiny house on a block of land somewhere beautiful and maybe even attempt my masters in the social science realm. I hope to inspire people to prioritize slow living, connection and health, above all. I hope to be the kindest, most authentic and courageous version of myself. But mostly, I hope to meaningfully contribute to the lives of others in any capacity, as often as possible. How do you bring nunchi into your day? nunchi oils have been a mysterious blessing in my world, coming into my life right when I need them most. I first started using nunchi during a challenging period in my life at the start of the year. During that time, I discovered a myriad of ways to alleviate the pressure and the sadness I was experiencing which my bottle of ‘no mud, no lotus’ played a magical role. There was something about spraying that oil a few times a day that not only eased the overwhelm and grounded me, but reminded me to trust my own resilience and strength. When I bumped into Di on my van adventures, I landed with a bottle of ‘wanderlust’ in my lap. Did I know that this little gem would be such a beautiful addition to my trip? Absolutely not. But before I knew it, I was half way through my bottle and wishing I had carried it along for the entire ride. Living on the road, you find ways of creating a sense of home no matter where you wake up. My bottle of wanderlust has been my home away from home. I had no idea that something so simple could be so grounding and so soothing all at once. Hence, I use it every morning when I wake up and in those brief moments when home feels like a foreign concept.